Did you see Pedigree Dogs Exposed part 2 last night? It was tucked away on BBC4 rather than being in a prime TV slot. I'm not sure if this is so that the controversy caused by the previous programme wasn't as heated or because in the few years since the original programme there has been such a huge shift in viewing and more channels added that the BBC thought this was a great place for people to find the programme. Whatever the reasons, die hard dog lovers watched this and have been commenting on social media. Unlike the last programme it hasn't been all over Breakfast News. I, and most of my dog training and behaviour colleagues as well as vets around the country are all saddened by the lack of movement with breed clubs and the Kennel Club in improving the health of pedigree dogs. Some breeders seem to be deliberatly ignoring the health of dogs for the way they look. This includes "culling" puppies that don't meet some ideal written down somewhere. Instead of having this pups put to sleep, why not have an exclusion that stops them being bred from? Or better still, include them in the breeding programme as they are possibly healthier than their perfect looking siblings. The Great British Bulldog is one dog that has really suffered at the hands of people. I have a couple of books on dog breeds, one that shows breeds from the 1930s and one that has earlier pictures. The Bully is totally unrecognisable as the dog that it is today. 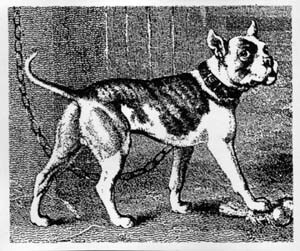 Pre the banning of bull baiting these dogs looked more like Staffordshire Bull Terriers or American Bulldogs, the dogs of today cannot give birth without human help and many have a hard time walking around the park, they would never be able to take down a bull. The Kennel Club talks about "fit for function" and some dogs, such as the Border Collie can't have full championships unless they are able to do the job they were meant for and round up sheep, the Bulldog will never be able to prove that it is "fit for function" put at least it should be able to move without panting for breath. The same for the poor pug, some of this breed have to have operations to clear out the shortened nasal passages of excess flesh, just to be able to draw breath. All the right noises have been made by breed organisations and the Kennel Club but they seem to be an attempt to placate rather than any real work on improving breed standards, a bit of rewording here and there, adding words like desirable instead of must be. Judges are still going to be looking for desirable and placing those dogs with desirable traits above dogs that are, for instance, less extreme. A lot of pedigree breeds seem to be more about how the dog looks than what the dog should be able to do. Does it matter that a Dalmation has Pointer genes in enable her and her off spring to be able to pee? She looks like a Dalmation, the bloodlines have been Dalmation for years. 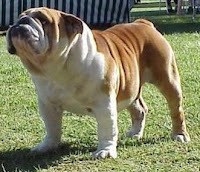 Breed societies should remember that their breed came about through the mixing of other breeds or types to make something unique. Outcrossing should be to improve the plight of the dog they claim to adore. There are some breeders out there who are trying to make things better, but there are some, such as the Boxer breeders who refuse to admit they have problems, juvinile kidney disease has been traced back and genetically proven to be a problem with a certain line, but these dogs are still being closely bred, giving their pups a double copy of the faulty gene and a death scentence. While I don't like the creation of designer breeds for profit (White GSD x Bichon puppies available in Scotland for more than the same breeder is selling pure Bichons) there are some cases where outcrossing helps improve the breed. In horses some breeds have to pass grading tests before their progeny can be registered, even pure bred foals are excluded unless both parents are graded. Some of these breeds have a sliding scale of grading. If your horse doesn't pass the grade it's babies are not eligable, if it's male horse you are expected to have it neutered. It's about function and not "beauty". Maybe the dog world should take a leaf out of the horse world's book. Cloverleaf has a new premises and will be offering new services from March 1st. A clicker workshop is planned for the 17th March and a loose lead walking workshop is set for 25th. you can download a booking form from the Cloverleaf website.